Powerful, flexible 2D & 3D home design software for architects and building professionals. Arcon Evo is the ideal solution for your design needs. Create detailed, accurate plans, elevations, cross sections and more. Using our automatic 2D to 3D interface, quickly demonstrate your designs in a fully interactive 3D model complete with finishes, decoration, furniture, and lighting. Arcon Evo provides professional results quickly and easily. Arcon Evo architecture software supports 3D printing. Fully customisable doors & windows, textures and materials. 3D furniture and objects, 2D symbols. New room planning option, multiple door styles. Comprehensive window options, fully flexible staircase designer. Complex roof designs made simple, dormer windows. Powerful trim and edit tools, scaled drawing with full dimension tools. Instant elevations, easy cross-sections, metric and imperial measurement units. Powerful measuring and ruler tools, automatic and manual dimension tools. Customisable wall construction types, detailed stairs editor. 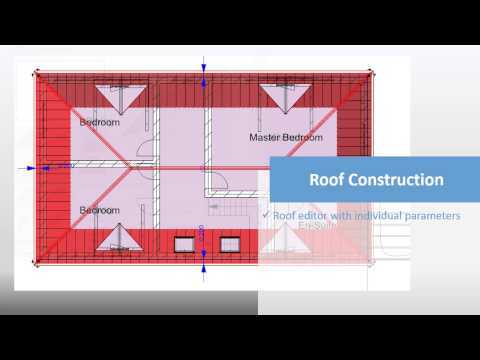 Produce simple or complex roof designs. Integrate balconies and custom railings, advanced wall outline editing. Modify existing walls with flexible editing tools. Automatically create a 3D model. Drag and drop objects and textures. Over 8000 furniture items and objects included. Over 4500 textures and materials for decoration. Add realism with 3D textures. Increase your library with import options. Add objects direct from Sketchup 3D warehouse, 3D virtual walk through. Define the site, plot or landscape. Enhance your 3d scene with picture backgrounds, check lighting and shadows. Fully integrated layout and detailing mode. Save plan layouts. Compatible with projects from classic Arcon. No previous CAD knowledge required. Easy to use interface for planning and design, import options, export options. Q. How many activations do I get? Q. Is 3D Architect Home Designer and Arcon Evo MAC compatible?